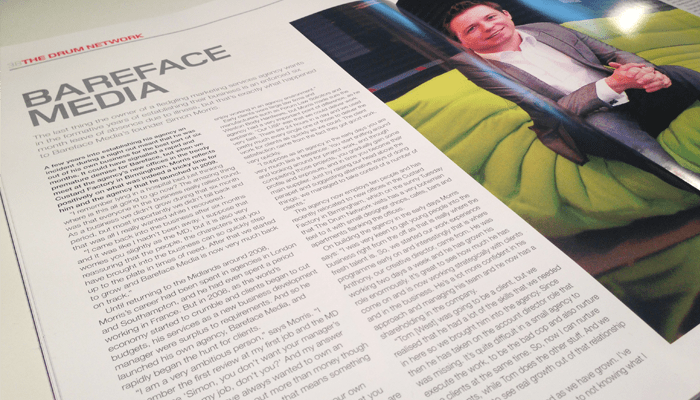 This months The Drum Magazine sees our very own Simon Morris, Client Services Director here at Bareface Media featured in a double page spread interview about how the agency started and where we are headed. You can read the full interview below. The last thing the owner of a fledgling marketing services agency wants in the formative years of establishing their business is a month leave of absence due to illness, but that's exact to Bareface Media's founder Simon Morris. A few years into establishing his agency an incident during a night out meant that he was out of his own business for the best part of six months. It could have signalled a rapid and premature demise for Bareface, but when we meet at the agency's new offices in the trendy Custard Factory in Birmingham, Morris reflects positively on what was Indeed a tricky time for him and the agency that he launched in 2009. "I remember lying in a hospital bed just thinking where is this all going to go now? The amazing thing was that everyone in the business really rallied round. As a business we didn't grow during that six month period, but most importantly we didn't fall back and that was all I really wanted while I recovered. "I came back into the business after six months and it was like I hadn't been away. I suppose that worries you slightly as the MD, but it is also very reassuring that the people, the characters that you have brought into the business can so quickly step up to the plate in times of need. After that we started to grow and Bareface Media is now very much back on track." the market was going at that time in 2008/2009 when I launched Bareface, the risks associated with starting your own business were a lot less than people may think. I never wanted to be a one-man band. I've come from an agency background and I very much enjoy working in an agency environment. Early clients were large law firms and manufacturers such as Forum Law Solicitors and Weston Body Hardware, but Morris made sure the agency had a very important point of difference, as he explains: "Our USP was that we could deliver the work very fast. There are 24 hours in a day and we used pretty much every single one of those to deliver the work for clients as quickly as we could. The client satisfaction came from the fact that they got good work, very quickly. "I suppose as an agency in the early days you are very much like a freelancer. You start sniffing around and looking around for project work, and through completing those projects, you gradually gain some profile and exposure, and in time you become their main supplier. Just by raising our head above the parapet and suggesting alternative ways of doing things, we managed to take control of a number of clients,"
The agency now employs ten people and has recently relocated to new offices in the Custard Factory in Birmingham, which on the sunny Tuesday that The Drum Network visits has a very bohemian feel to it with small designer shops, cafes, bars and apartments flanking the offices. "We do a lot of pitching. My approach is that you have to be in it to win it. We are doing a lot of pitches at the moment, but I feel they help you to fine tune yourselves and you get to do work that you wouldn't ordinarily get to do". On building the agency in the early days Morris says: "I was very keen to get young people into the business right from the off as that is really where the fresh talent is. So, we started our work experience programme early on and interestingly that is where Anthony, our creative director, came from. He was working two days a week and he has grown his role enormously. It's great to see how much he has come on and is now working strategically with clients and in the business. He's a lot more confident in his approach and managing his team and he now has a shareholding in the company. "Tom [West] was going to be a client, but we realised that he had a lot of the skills that we needed in here so we brought him into the agency. Since then he has taken on the account director role that was missing. It's quite difficult in a small agency to execute the work, to be the bad cop and also nurture the clients at the same time. So,now I can nurture the clients, while Tom does the other stuff. And we are starting to see real growth out of that relationship building. the agency, what things we need to put into place to improve our performance, what we need to put in place to do things quicker, but still to a high standard and finally, improving our clients, not just the ones we currently have, but getting involved In business development again." To support that business drive, Bareface now has an office in Shoreditch, London to meet quickly with clients, should the need arise. Morris also has a number of side projects on the tech front that he is involved in and late last year he was in the US to raise funding to move these projects forward. Morris says: "We do a lot of pitching. My approach is that you have to be in it to win it. We are doing a lot of pitches at the moment, but I feel they help you to fine tune yourselves and you get to do work that you wouldn't ordinarily get to do". "We still feel very young as an agency, but we are getting recognised now. Anthony was the Creative Director of the year at the MiAwards and we are involved with the RAR, which gives people internally a lot of pride. There's a good competitive spirit in the Midlands and we like to be competitive with other agencies around us, so to be involved in The Drum's various polls and awards is great for that." Morris says: "We are working on our three-year plan and we are aiming to double in size, but obviously you need to keep your margins up as you grow. But also we want to increase the make-up of our clients. I don't see us going into B2C, that's not the background of the agency. We don't want to be seen as a jack of all trades. We are targeting two markets specifically - we have a lot of experience in medical devices and manufacturing. We are a hard working B2B agency and we are really focusing on these areas for growth."